Click on our 'MEDIA' page for growing list of evidence that HandyAudit saves money and improves quality of care. 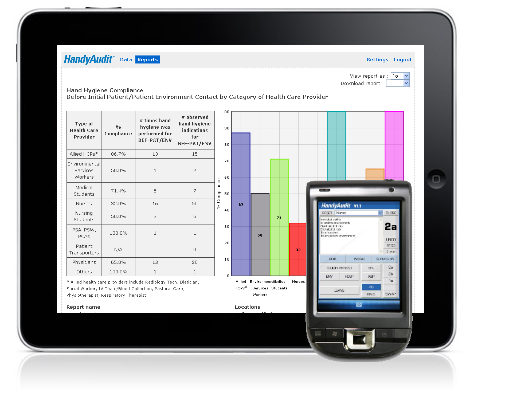 HandyAudit is a revolutionary, academically validated hand hygiene auditing system for recording hand hygiene behaviours. The system supports both 4 and 5 moments of hand hygiene and works by having auditors record actions using a handheld, touch-screen tool (such as an iPad) to record their observations. These observations are then synchronized to a central computer, where the data is automatically analyzed, reports are generated and trends are highlighted - all at the touch of a button! The resulting information is invaluable in developing educational initiatives to break poor hand hygiene patterns. Read about the core functionality and the benefits HandyAudit offers to different stakeholders. This brief document highlights the HandyAudit philosophy, while demonstrating its value for all levels of your auditing and management teams. Read below for more on how HandyAudit can benefit you. Auditors across 100+ hospital sites using HandyAudit have observed over 180,000 hand hygiene indications across 90,000+ health care providers. More are being added every day! You record actions, HandyAudit calculates results. With most other tools, auditors continuously think through a complex set of rules. HandyAudit is different - with HandyAudit auditors record simple actions and compliance is automatically calculated. No more transcription and complicated report generation. HandyAudit is an entirely automated electronic recording system. HandyAudit collects rich context which allows you to see the data behind the decisions. Because HandyAudit records all the evidence around hand hygiene, detailed transcripts can be used for education and historical analysis. With HandyAudit, auditors only record actions and behaviors, eliminating the need to determine compliance on the spot. The HandyAudit system applies Ministry standards automatically, consistently and objectively.